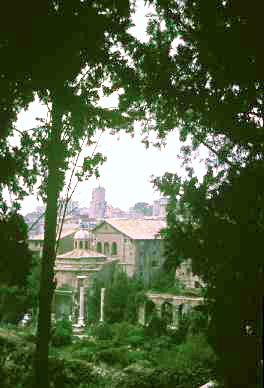 The Palatine, according to legend, is the place on which Rome was founded. 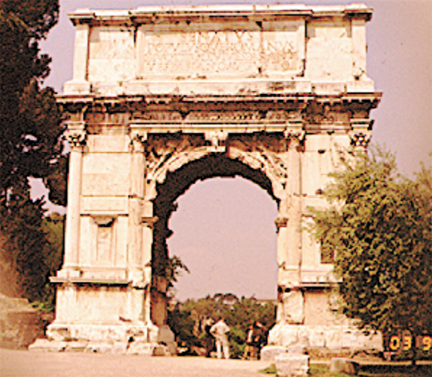 It has lost a lot of its majesty over the past two millennia, but still forms an impressive flank on the southwest side of the Roman Forum, running from the Arch of Constantine in the south to the Capitoline Hill in the north. 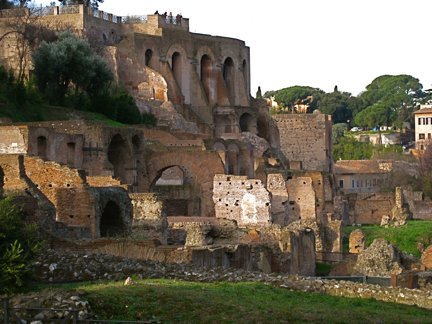 The Palatine was known as the West End of Rome, and housed the wealthy citizens of the city, where the emperors and their dependents lived, some in multi-storied apartments. What grabs your attention and gives you the feeling that you are in Rome is not a building or even the ruins of the Forum – it is the pines, the trees popularized by Ottorino Resphighi's orchestral work, the Pines of Rome. Though his four pieces celebrating pines did not describe those on the Palatine, Resphighi's music gives a feeling of Rome that these trees exemplify. 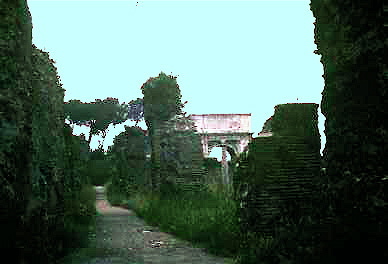 The Arch of Titus is immediately adjacent, and stands as tall as this hill. The ancient Via Sacra, the Sacred Way, runs through it, so you can imagine Imperial forces marching through in triumph (thus the name of those arches built throughout the Roman Empire). The pines are tall, stately, elegant, and imperial - everything we think of when conjuring images of ancient Rome. The trees flank and define the path beneath them. Just how much of a “Republic” was Rome? Following the suggestion within the text, make a comparison between the Maison Carrée and the Capitol of Virginia. Should Jefferson have so modeled designs after Roman, and should so much of United States' governmental architecture be so influenced by Roman design? Note that this is an on-going question, since the recently-opened (June of 2004) World War II Memorial in Washington, D.C. would have fit so perfectly in ancient Rome. 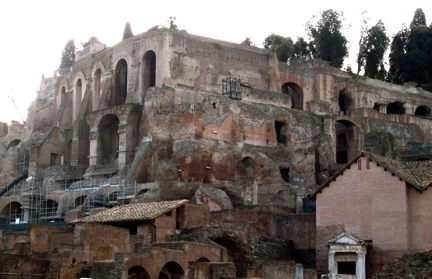 The Palatine is the best way to see the Forum. Just look down, and the glory of what was once Rome lies ruined below. Poetic justice, perhaps, because mighty Rome laid waste to a lot of territory and a lot of people. But architecturally they remained as giants, and showed the way for the next two thousand years. 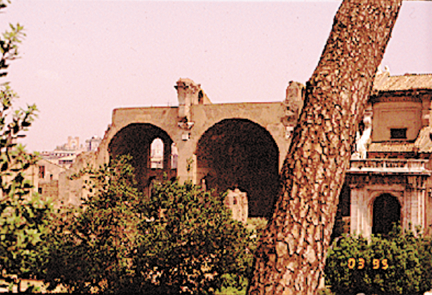 Looking across the Forum, we see the ruins of the Basilica of Constantine and Maxentius. 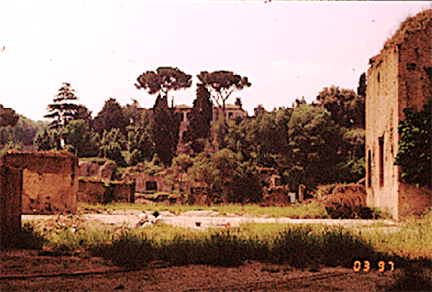 Interestingly, the area between the Palatine and Capitoline Hills was low land, actually a swamp. It was the scene of the world's first large-scale drainage system, taking the waters to the Tiber River. What was essentially a sewer became known as The Big Drain (Cloaca Massima), and still functions after 2,600 years of use. Funny, but living where I do today in South Florida in the 21st century C.E., my neighbors and I face serious flooding every time it rains more than a couple of inches. So much for progress! The Everglades should, perhaps, never have been drained.